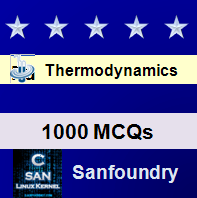 This set of Thermodynamics Multiple Choice Questions & Answers (MCQs) focuses on “Boundary Work in a Multistep Process”. 1. A cylinder contains 1kg of ammonia. Initially the ammonia is at 180°C, 2 MPa and is now cooled to saturated vapour at 40°C, and then further cooled to 20°C, at which point the quality is 50%. Find the total work for the process, assuming a linear variation of P versus V.
2. A piston cylinder has 1.5 kg of air at 300 K, 150 kPa. It is now heated up in a two step process. First constant volume to 1000 K (state 2) then followed by a constant pressure process to 1500 K, state 3. Find the work in the process. Total work = P3(V3 – V2) = 500(1.2915 – 0.861) = 215.3 kJ. 3. A piston-cylinder assembly has 1kg of R-134a at state 1 with 600 kPa, 110°C, and is then brought to saturated vapour, state 2, by cooling. The cooling continues to state 3 where the R-134a is saturated liquid. Find the work in each of the two steps, 1 to 2 and 2 to 3. 4. R-22 is contained in a piston-cylinder, where the volume is 11 L when the piston hits the stops. The initial state is 150 kPa, −30°C with V=10 L. This system warms up to 15°C. Find the work done by R-22 during this process. Since T2 > T1a then it follows that P2 > P1 and the piston is against stop. Work = ∫ P(ext) dV = P9ext)(V2 – V1) = 150(0.011 – 0.010) = 0.15 kJ. 5. A piston-cylinder contains 50 kg of water at 200 kPa with V=0.1 m3. Stops in the cylinder restricts the enclosed volume to 0.5 m3. The water is now heated to 200°C. Find the work done by the water. 1W2 = 1W(stop) = 200 (0.5 – 0.1) = 80 kJ. 6. Ammonia in a piston/cylinder arrangement is at 80°C, 700 kPa. It is now cooled at constant pressure to saturated vapour (state 2) at which point the piston is locked with a pin. The cooling continues to −10°C (state 3). Find the work. 7. A piston-cylinder contains 1 kg of liquid water at 300 kPa, 20°C. Initially the piston floats, with a maximum enclosed volume of 0.002 m3 if the piston touches the stops. Now heat is added so that the final pressure is 600 kPa. Find the work in the process. 1W2 = ∫ P dV = m*P(lift)*(v2 -v1) = 1 × 300(0.002 − 0.001002) = 0.30 kJ. 8. 10 kg of water in a piston-cylinder exists as saturated liquid/vapour at 100 kPa, with a quality of 50%. It is now heated till the volume triples. The mass of the piston is such that a cylinder pressure of 200kPa will float it. Find the work given out by the water. Explanation: Process: v = constant until P = P(lift) then P is constant. 9. Ammonia at 10°C with a mass of 10 kg is in a piston-cylinder arrangement with an initial volume of 1 m3. The piston initially resting on the stops has a mass such that a pressure of 900 kPa will float it. The ammonia is now slowly heated to 50°C. Find the work in the process. Work = ∫ P dV = P(float) (V2 – V1) = 900 (1.648 – 1.0) = 583.2 kJ. 10. A piston-cylinder contains 0.1 kg saturated liquid and vapour water at 100 kPa with quality 25%. The mass of the piston is such that a pressure of 500 kPa will float it. The water is heated to 300°C. Find the work. 1W2 = P(lift)*(V2 – V1) = 500(0.05226 – 0.04243) = 4.91 kJ. 11. A constant pressure piston cylinder contains 0.2 kg water in the form of saturated vapour at 400 kPa. It is now cooled to occupy half the original volume. Find the work in the process. W = ∫ PdV = P(V2-V1) = 400 kPa × (0.04625 – 0.0925) m3 = -18.5 kJ. 12. A piston cylinder contains air at 600 kPa, 290 K and volume of 0.01 m3. A constant pressure process gives out 54 kJ of work. Find the final temperature of the air. 13. A piston/cylinder has 5m of liquid 20°C water on top of piston with cross-sectional area of 0.1 m2. Air is let in under the piston that rises and pushes the water out. Find the necessary work to push all the water out. 14. A piston/cylinder contains 1 kg water at 20°C with volume 0.1 m3. While the water is heated to saturated vapour, the piston is not allowed to move. Find the final temperature. T2 = Tsat = 210 + 5[(0.1 – 0.10324)/(0.09361 – 0.10324)] = 211.7°C. 15. A piston cylinder contains 3 kg of air at 20°C and 300 kPa. It is now heated at a constant pressure to 600 K. Find the work in the process. work = ⌠ PdV = P (V2 – V1) = 300 (1.722 – 0.8413) = 264.2 kJ.